This Friday! At Observatory! Live human dissection, lecture and Book Launch by The Hollow Earth Society; full details follow. Hope to see you there! "Not since Galen’s De Elementis has been set in ink a single compendium of medicological knowledge so extensive & practicably useful as SUSPICIOUS ANATOMY Workbook No. 15: The Human Cranius. Having intrinsic value to all persons—piratical, mysterious, upright, or otherwise—The Human Cranius is a PEERLESS GEM of uncanny truth. If you are a living human, you should make frequent, unabashed forays into this field guide to your hideous secondary body—the cranius, an organ-matrix & carnival of fangs which is trying to destroy you even as you read this sentence…"
From the genre-chainsawing minds of the Hollow Earth Society (Ethan Gould and Wythe Marschall) comes “the definitive guide to the horrifying world inside you”—finally available in lush, illustrated paperback! In many ways, the art and human studies of modernity have given us the keys to our unconscious minds, but have left entirely to dry science (fixing plumbing, testing drugs) the workings of our bodies. What does it feel like to have guts? To face disease, age, mutation—in short, a self that is not only not whole but not even on its own side? 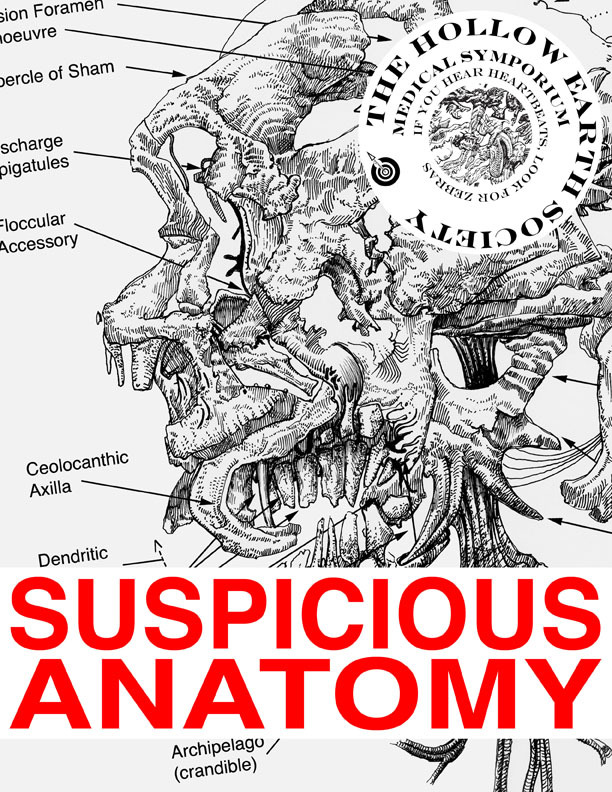 The SUSPICIOUS ANATOMY series seeks to address these physio–psychomological imbalances by producing, for your benefit, the entire unconscious of the body, the shadow-self, in words and elaborate images. The official Human Cranius book launch features a lecture, medicological film snippets, and a live human dissection. Join us! About the Hollow Earth Society: For over one hundred years, the Hollow Earth Society has probed the world’s most bizarre and pertinent mysteries via an ever-mutating set of handbooks, rogue histories, and practical manuals. The Society is currently led by Colonels Ethan Gould and Wythe Marschall. Ethan Gould is a Brooklyn-based artist working in drawing, puppetry, writing, and video to exploit the moments when the formerly robust process of perceptual categorization snaps like the fragilest of dry twigs. A graduate of the University of Rochester, he helped to create several development programs at the American Folk Art Museum. His work has appeared in such disparate places as the Ontological-Hysteric Theater, The Assembly Theater Company, The Brooklyn Review, Pomp & Circumstance, and ABC’s Wife Swap. Wythe Marschall is writer. A graduate of Bennington College and the MFA fiction program at Brooklyn College, where he teaches undergraduate literature, Wythe has published stories and essays in McSweeney’s Quarterly Concern, Ninth Letter, and elsewhere. He is the senior editor of the Atlas Obscura and an editor of Pomp & Circumstance, as well as a frequent reader for Electric Literature. His thoughts on letters, postmodernity, and hip hop can be found on his website, chronolect.com. You can find out more about these presentation here. You can get directions to Observatory--which is next door to the Morbid Anatomy Library (more on that here)--by clicking here. You can find out more about Observatory here, join our mailing list by clicking here, and join us on Facebook by clicking here.